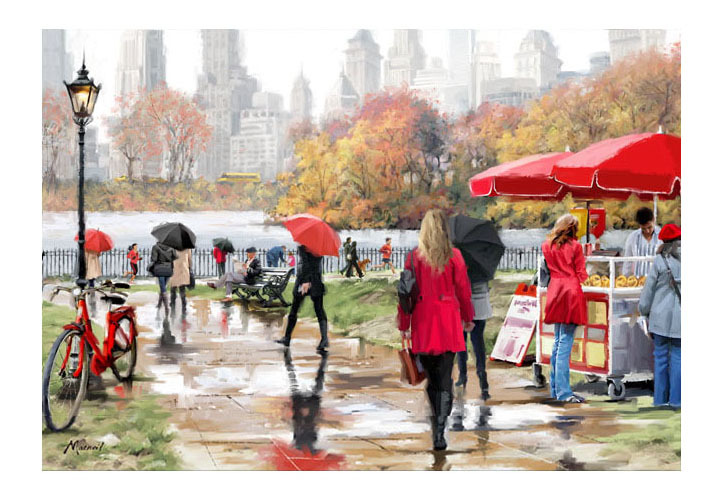 This particular print, "central park" will compliment any decor beautifully. Within this print Richard's vision was to capture the iconic location as a means of representing a busy, bustling feel. Richard Has used the colour red to accent the piece and add depth, which only serve to enhance Richards idea of a bright busy feel. Here at The Macneil Studio we feel Stretch Box Canvasses give a modern, contemporary feel to displaying artwork. The Stretch Box Canvas format allows the artwork to be showcased perfectly- with no frame or mount to distract from the beauty of the design. We have found stretch box canvases work exceptionally well with Richards work and he personally feels "Stretch Box Canvases allow the art to be hung exactly as he sees it when painting the canvas- art at its purest form"